Have a sparking, cracking creative new year everyone. is an internationally award-winning performance poet. He is 2017 Glastonbury Festival Poet in Residence, winner of 2017 Saboteur ‘Best Spoken Word Artist’ award and has toured his verse across USA, Canada, India, New Zealand, Australia, South America and Europe. His other awards include winning New York’s Nuyorican Poetry Cafe Slam, UK Superheroes of Slam and, as of 2017, seven Arts Council England Grants for the Arts awards. 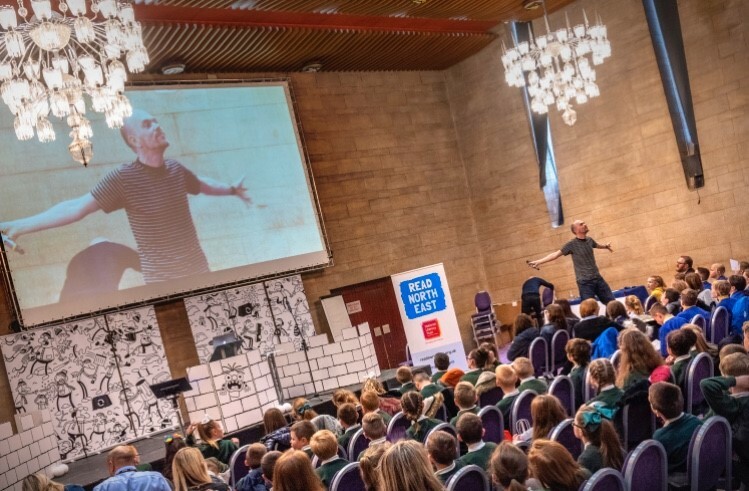 He is currently touring three shows, his adult verse ‘No Tigers’, ‘The Boy Who Cried Wolf’, in collaboration with Big Imaginations, Action Transport Theatre and Arts Council England, and ‘Aaaaaaaaaaaaagh! Dinosaurs!’, voted by Fest as one of the Top 7 shows for families at Edinburgh Fringe. Gerry Potter, as Chloe Poems, the gingham clad socialist transvestite in the much missed greenroom theatre, 1999. As a performance poet, I don’t write everyday, much of my time is spent on the road touring the work I have already written to new places. I travel this country and others and very very rarely write on the road. When I do sit down to dedicate some time to writing the main goal is first draft first draft first draft, don’t overthink, just get the first draft down, then tear it to bits and not be previous be prepared to rewrite rewrite rewrite, find what works and deeper explore,elaborate and edit, with the help of experienced artists whose views I respect. Writing one short poem can take months or years, but of course I usually have several half finished poems in a draw waiting for their next draft. I’m about to enter a long length of time touring so no new writing will be happening for a bit. Unless the muse strikes me very hard on tour, which sometimes happens, but I try to keep performing and penning very separate activities, to give the full attention needed to both. It’s horrible to be horrible and lovely to be lovely. Our power and money obsessed society sees profit over kindness ever and ever increasingly, and any art which can generate compassion and understanding, with some humour and fun and imaginative wordplay, is where I hope to be. My advice to anyone wanting to get into art is that you are not an island, none of ya are islands, we are less informed and less skilful if we isolate ourselves from the knowledge and experience of others, so carefully choose people you consider excellent at what they do and actively seek their critique, opinions and, whenever possible, immerse yourself in their work. Be part of a scene. 8. . Tell me about the writing projects you have on at the moment. I have loads of touring coming up, and it’s always ace to see people at gigs. Please check my website – Dominicberry.net – and if I’m performing near you, please do come see what I do! frail crisp packets that open before sale. lids open goods inside. Some marked down. catches corner of a bag of sugar. Sellotape the dribble. to consider the goods worthwhile. This is the stock that Paul Brookes deals with. The simplicity of the language describing an everyday routine event – part of the job – adds tremendous power to the poem in my opinion. Most of the poems are about the workplace – another thing that the poetry world often ignores or finds itself unable to accept. It’s a dirty subject is work done by people with dirty hands – how could they know anything about poetry? Brookes works as a shop assistant – behind a till – though this isn’t the most important thing – it could be any retail store, any call centre, any restaurant or hardware shop where a shop assistant interacts with the public. But they are also far more than just about work – his writing captures the shadows of an event – a transaction – that Brookes has seen actually contains far more than what just happened. And from that you get a unique insight into people’s lives – the minutiae of them – a throwaway comment that Brookes uses to explore the possibilities of, amongst other things, existence, loneliness, poverty, addiction, camaraderie and community. so he has an hour. “Just ran all way here. mouth before a wall of sweets. of small chocolate eggs at 49p. His delight makes me smile. The humour and warmth Brookes has for the ‘customers’ who are members of his community is evident throughout the book. In fact, I think one of the best things about these poems is the sense of community that permeates through them – which in an age where it has become increasingly more difficult to find any sense of community anywhere other than on-line is both heart-warming and uplifting. A lot of writing is now about isolation and loneliness, finding some kind of identity or meaning in amongst the big cities and masses of people. And you wouldn’t really expect anything less considering that we now live in a post-Thatcherite, post-New Labour society where the dissolving of industry and the replacement of full-time work with zero –hour or part-time ‘hire and fire’ alternatives has caused so many communities to break up into little bits. The first empties her packed trolley. Do you need any carrier bags? What we’re taking in the caravan. Why did I buy so much? Yes please while I empty this. We’ll do it for you offers one of the other women. We’d love a caravan holiday. Don’t take up much space. Five carrier bags full later she says. I’ll have to fetch my car round. I’ll never carry all this. We’ll carry it for you. We’ve only got these odd goods propose the other two women. I can’t have you doing that. Please Take Change is full of this life affirming feeling. Even when Brookes deals with the grimmer unluckier or sadder side of life he does so in a considerate way – never judgmental or vindictive and always with humour – dark or otherwise – because that’s the only way how Brookes – and so many more of us – can even hope to survive. No, this is my shopping. the bags. What I married him for. Aye he says Fetching and carrying. I bag ’em up and lug ’em home for her. She adds we don’t live together. whilst his uncut nails tremble. wish him a grand day. and the queue at my till grows. I wrote my first poem at 7. My parents had been told I’d never be much of a reader or writer. I’d swapped schools as a result and was slowly trying to catch up. I remember the teacher told us we could write describing sentences about Autumn and this was going to be a poem. My handwriting was appalling but she painstakingly got me to read it back to her and then showed the headteacher who said I could type it up. It was a green Amstrad computer – the only one in the school, it took me forever to find the letters but I realised this poem thing was a way that I could communicate what was inside my head, something I’d never had before. 2. So would you say she introduced you to poetry? She introduced me to the idea of writing in a certain style, but my introduction to poetry came much later. I don’t think I understood at that age that this was a thing that other people did as well. 2.1 How did the poetry community emerge for you? At 15 I read in a local newspaper that a poet was to lead adult classes at the library. I forged notes to my Physics teacher so i could attend the class on a Wednesday afternoon. The poet was Barry MacSweeney. In my late teens Barry was the only poet I knew and he was my poetry community. He would send me books in the post and we spoke everyday on the phone until his death in 2000. I stopped writing when I went to university for a time as I found writing academic essays to really kill my creativity. After I graduated I was invited to be part of the Gen Txt tour with penned in the Margins and that was my little community for a while. A real sense of poetry community is a relatively recent thing for me. 2.2 What was Barry’s legacy to you? 2.3 How did the Gen Txt Community work for you? Tom Chivers introduced me to a lot of people, such as Les Robinson who was then editor at Tall Lighthouse, he published my pamphlet collection. Seeing how people like Inua Ellams and Joe Dunthorne who were both part of that collective were working showed me what could be archived. I am still a huge fan of all three of these guys and they’ve all gone on to be incredibly successful. It was strange because after that tour I went back to Cumbria and they all lived in London so I did fel very isolated in terms of community and opportunities. 3. How aware are and were you of the dominating presence of poets, traditional and contemporary? Blake was a big influence in my teens and I would re read Songs of Innocence and Experience over and over. Emma: What do you mean by dominating presence of poets ? Paul: Some might say poetry was once dominated by white, male upper class closed coterie. Yeah, most of the stuff that I was shown at school was white male and I certainly had an idea that that was what a poet was. I had a lot of difficult stuff around my own gender on top of this so it was a thing that I was aware of. MacSweeney introduced me to the work of Anne. Sexton and that was a big moment fir me, though I found it very hard to write after reading her as I was trying to emulate a voice that felt so different to me. At university there was a section titled ” women poets” which I really hated as I disagreed with the separatist nature of it. I knew the poem Tiger Tiger from somewhere. I loved the rhythms and images but I don’t actually remember who introduced me. As kids we had a few books that were nursery rhyme books or written in verse and I always liked those. I thin Tiger may have even have been on ine of them. Its a big leap from Blake to Sexton. Describe the “Big moment” of her. There were stepping stones in the middle! No apols needed. I get the gist. I go through editing when I collate the answers. Its important to get down what you feel. Grammar and spelling is corrected later. Access to work was actually a bigger thing than I realised. I was very isolated and so MacSweeney was a gateway, but of course they were his choices. I am much better at being in a routine when I am editing my own work. You’ve acquired a work ethic? I’ e acquired a deeper commitment to myself as a writer I think. For a long time I found it hard to take myself seriously. I’ve had imposted and proper job syndrome. I go back to MacSweeney almost as an answer. Like I randomly flick open a book of his and read two lines and take it as advice for the week – which yields some pretty weird results! Carol Ann Duffy links into my next question: Who of today’s writers do you most admire and why? i am also priviliaged that as a a white woman in a western country, my writing can be heard. the classic advice of read a lot. Final Question: Tell me about a writing project that you’re involved in at the moment. Delighted that my new book “Please Take Change” is Featured Book of the Month in December’s Glomag. Thankyou, Glory. I thought it would be nice to round up the year with what I’ve enjoyed in the arts from people to films, art exhibitions to poetry. So here goes, if you don’t feature, by the way, it’s not because I didn’t like your work, I’ve enjoyed countless books, films, events and exhibitions this year, so thank you for enriching my life! has a PhD in English Literature from Cardiff University. He is a two-time winner of the Terry Hetherington poetry award for writers in Wales, and his writing has appeared in Spectral Realms, Picaroon, Amaryllis, Wales Arts Review, isacoustic, Lonesome October, The Road Less Travelled, Three Drops From A Cauldron and Words for the Wild. I decided to write poetry while picking apples on a Waitrose farm in the Autumn of 2008. It’s a job I’ve always loved; a job that lets your mind wander freely while your hands are busy. Robert Frost’s poem, ‘After Apple-Picking’ was running through my head like a earworm pop song, and I was thinking about how much I’d enjoyed reading The Odyssey in sixth-form that year, and I decided I too would write an epic poem. It was an ambition I junked a very short time later, when I realised quite how inadequate my original plan was, but by that time I was enrolled in a local poetry group and busily trying to figure out how iambic pentameter worked. I set myself to memorise Tennyson’s ‘Ulysses’, and it decoded in my head halfway through, one of those beautiful moments where sometime complex suddenly becomes clear. I got hooked, and remained hooked, on the metrical craft of form and metre, and I’m still much more engaged and interested in the writers of the eighteenth and nineteenth centuries than I am with the free verse writers of the present day (which is part of the reason why I went on to do a PhD in the influence of John Milton on eighteenth-century poetry). It was a great liberation for me to experience poetry that didn’t have to be personal, angst-ridden or confessional but was simply a different kind of storytelling, and pleases the ear as much as it does the mind. I don’t think there ever was a particular moment of introduction. My Dad had been reading me ’T’was the Night before Christmas’ every Christmas eve since I was a kid, so I grew up enjoying the rhythms and the textures of words, and I can remember producing some fairly successful primary-school doggerel at times. My introduction to what you might call the poetry scene was a now-defunct poetry group that gathered in the Oxfam Bookshop in Winchester. We’d begin with a mini-lecture and discussion of an established poet, and then we read each other’s work and comment on it. They were very kind to me, because I’m sure I was terribly self-involved and nigh-on unbearable, and it’s pretty much spoiled me for Creative Writing classes ever since. I was also buying up all kinds of secondhand poetry from the bookshops of Winchester—my Byron and Shelley are one volume collected editions from the 1900s with two columns of tiny print per page—and reading voraciously. Before I started writing poetry seriously, I’d worked through the then-standard GCSE anthology of poets in English Literature classes, so we read Heaney, Armitage, Duffy and Clarke, none of which I really cared for either then or now. The hits were Robert Browning’s ’The Laboratory’, a creepy murder story with an irresistible chanting rhythm, and Gerald Manley Hopkins ‘Inversnaid’, a poem that roils and broils on the tongue like the swirls and eddies of the brook it describes. For most of my developing years, I was obsessed with developing the techniques necessary to sound like the poets of the English tradition: I read Paradise Lost two or three times over, trying to get a grip on the ins and outs of blank verse, which is something no-one ever teaches you in school or university, sadly. Don Paterson’s Selected Poems was the first modern poetry book I truly loved, particularly ‘Rain’, his astonishing closing poem. Other living poets I enjoy include AE Stallings, Jonathan Edwards, Clive James, Wendy Cope and Andy Croft, as well as ingenious verse translators like Anthony Mortimer and Stanley Mitchell. I like poets with a disciplined sense of form, a lively sense of humour and an engaging variety of subject matter. I try not to feel too daunted either by the past tradition or the bulk of poets writing in the present day; I’ve got a very strong sense of the kind of ‘verse storyteller’ direction I want to go in, and it feels very free and wide open. 4. Who of today’s writers do you admire the most and why? In this you could expand on why “Rain” is so effective. And give reasons why you enjoy the others. One of my favourite exercises is the invitation to simplicity, to the John Clare-ish enthusiasm to the world about us, that comes from starting a poem with the words ‘I love’. (Mine turned out to be about pencils.) Metrically, too, that first line couldn’t be simpler: iambic tetrameter in words of one syllable. Then the second line breaks with all formality, repeating the rhyme word from the previous line, running the rain / braid stresses together, in the service of a lyrical assonance that couldn’t be achieved in a more regular metre. The half-rhymes between dress and face as well show this is a poem well aware of the old rules, but willing to shirk them in the service of a sweeter lyricism when it becomes available. It ran in my head like an earworm all summer, but I still haven’t laid all its mysteries bare, and I’m not sure I want to. Like much of late Yeats, the feeling it creates is sufficient even without going into the deeper structures of meaning that underlie something like ‘Byzantium’. 5. What is your daily writing routine? It would be nice to have one! The closest I came to a proper routine was NaPoWriMo this year, where I woke up to a new poetry challenge each morning, thanks to the Poetry School group. I produced an awful lot of terrible doggerel, but three of those poems have since been published, and two more of them are in competitions. Currently I’ll try to knock out at least 300 words minimum on the novel project and fit in some verse around that, but like a lot of writers I’m deeply perverse when it comes to self-discipline. Switching to pencil and paper often helps unblock things, particularly in the early stages of composition—I’ve been known to scrawl couplets across Amazon parcels and the endpapers of books when the fit’s upon me. Lately I’ve been walking out to Insole Court, a grand Victorian house quite close to me in Cardiff. It’s free to get into and has a beautifully decorated pre-Raphaelite reading room, which makes a great location to work in even if I do keep getting caught up in browsing the bookshelves! If all else fails, I take a notebook out to the pub. The writers we read when young create our sensibilities, which is why it’s impossible for me to see a sheep from a distance without thinking of R.S. Thomas, or see daffodils without drawing Wordsworth to mind. I’m sure you’ve noticed in doing these interviews that everyone has different ideas of when you can call yourself a poet, from people who defer the title until they’ve published a book or can make a living from writing (pretty rare, in the case of poets), to people who will adopt it from the moment they write their first poem. My personal notion is that to be a poet, you have to have an understanding of the world that is shaped and mediated by poetry, which is why it’s so important to read as well as write verse. I read omnivorously when I was young, but in terms of the novel, I was a great devotee of R.S. Stevenson and Arthur Conan Doyle. It’s where some of my enthusiasm for that much-slighted virtue of storytelling comes from, as well as the interest in pirates that first led me to publish in Picaroon. I save admiration for the ones I know, like my friend Rahul Gupta in York, who is labouring over his Arthuriad, an epic poem of an ambition that outsoars anything else this century. A fragment of his “Interlude” was published in Long Poem Magazine a year or so ago. Poetry editors can be distant & impersonal, so it was very fortunate that I encountered Kate Garrett early in my career when I was looking for a home for my pirate ballads. A lot of submissions guidelines are terribly wishy-washy, so it’s a joy to read something crisp & precisely targeted. I write because when it’s going well, it’s a purer, more intense form of the buzz you get when you’re reading something so involving that the world drops away from you, & I’ve been hooked on that rush ever since I was a small child. I also write because when I want to tell & retell stories, to share the forgotten narratives behind our common signs & symbols. Where I live in Wales, for instance, hardly anybody knows why there’s a red dragon on the flag or knows the story of Vortigern’s tower, & that’s a bit of ancient British legend I love retelling. is a poet located in Orlando, FL. He runs weekly poetry workshops at his university and is the literary editor for Tongue Tied Mag. Sean’s work is forthcoming or featured in Rising Phoenix Press, Ghost City Review, Bombus Press, L’Ephemere Review, and 8Poems. He has an obsession with the surreal, the uncanny, and the vaguely familiar. You can find him on twitter @seanyglatch. He can also be found at 7-weeks.tumblr.com, though it isn’t a place devoted to his work so much as a place where he keeps store of inspiration and sometimes posts poems. I think I was 14 at the time I started writing, it was the year when Instagram and Tumblr poetry became a big community and was largely run by teenagers and young adults looking for healthier ways to express themselves online, and I was inspired to be a part of that community because I also liked writing and was looking for safe spaces to express myself. Looking back, I can hardly recognize myself in those poems I wrote – they were largely written for social media and not for myself – but it was that search for a safe space I could express myself in that motivated me to start writing. I think it was the internet, to be quite honest, and the exposure poetry started getting on social media. I wish I could name someone, a teacher or even just another poet, but my start to poetry definitely wasn’t conventional, and it took a long time for me to get exposed to the right poets and start taking myself seriously as a writer. When I first started very little, since the community I was in was mostly teenagers. But as I’ve gotten older and more serious as a writer, and as I’ve become more involved in creative writing through lit journals and academia and such, I’ve definitely become a lot more aware of older poets and the general establishment that quietly rules the poetry world. It involves simply sitting in front of a blank page and reflecting. Some days I’ll write on that blank page, some days I’ll simply sit in front of it and let my thoughts wander where they go, but those days I don’t write anything are equally important – perhaps more – because I’m not pressured to put down thoughts I don’t have the words for yet. For myself, anyway, I think experiencing the world and who I am quietly is more important, otherwise I’ll never express myself the way I want to. I don’t mean to sound dramatic, but I think the whole world inspires me to write. There are so many aspects of the human experience and so many beautiful things in the world I have yet to discover, and I want to write about as much of it as I can. I think my work ethic is kind of dependent on whether or not I’m inspired by something. Right now I’m writing a lot because I’ve been doing the December Challenge where you write a poem every day, and I had a really good professor last semester who helped me grow a lot in my writing, so I’m definitely riding that wave of growth for as long as I can, but when I’m in dry periods where I’m not particularly inspired by anything I spend a lot of time thinking instead of writing, and a lot more time distracting myself instead of thinking. When I was young I was obsessed with magical realism. Harry Potter, Narnia, The Percy Jackson Series – those books defined a lot of my childhood, and I think a lot of those elements creep into my writing today, from Greek mythology to poems where I’m shapeshifting or a doppelganger or creating something out of nothing. Oh man, that could turn into a laundry list very quickly, so I’ll try to keep it short. I have endless admiration for Danez Smith, Hanif Abdurraqib, Melissa Lozada-Oliva, Franny Choi, etc. – poets who continue to break boundaries and are finally receiving the recognition they deserve. I’ve gotten to know Lyd Havens a lot better this year and find them to be both a friend and inspiration. Also always inspired by Richard Siken, Margaret Atwood, Tracy K. Smith, sam sax… I’ll quit name dropping and end the list there, but you get the point. What else would I do? Literature has always been necessary, but now we live in a news cycle that’s so heavy that it’s beginning to break the Earth. If I ever become a doctor or engineer or actor or mathematician or sculptor or whatnot, I will still always be a writer first. There’s no one way to be a writer, so if you call yourself a writer, you’re a writer. Not a “soon-to-be” writer, not a “not-yet-established” writer, not an “in-progress” writer, you’re a writer, even if you haven’t yet written a word. That’s kind of hard for me to answer – my process is to write first, then go back and look at themes/motifs/ideas and kind of go from there. Once December is over, I’ll go through the 31 poems I wrote and try to get a sense of what is going through my head, put ideas together, and maybe I’ll write additional poems and make it a manuscript or put it out as a chapbook or do something else entirely. But right now, I just want to write – no manuscripts in mind, no journals I’m writing for, no competitions I’m entering, that way I know that I’m the writer behind each poem.